Bianca’s been uprooted from her small hometown and enrolled at Evernight Academy, an eerie Gothic boarding school where the students are somehow too perfect: smart, sleek, and almost predatory. Bianca knows she doesn’t fit in. A slow start to another vampire boarding school series. Stick around through the first half and it picks up the pace. There’s lots of romantic angst, but plenty of the good stuff to balance it out. Not as much vampy-ness as I would have liked, but I’m guessing that’s what book two is for. Desperate for her teacher-parents to take her back to her hometown, to her friends and away from the secluded, Evernight Academy, Bianca gets up before the break of dawn and runs away. But not before making her bed, she’s a good girl like that. Out in the woods, she runs into danger and gets saved by an angular jawed boy named Lucas, with ‘amazingly dark green eyes’. There’s an instant attraction, and rather than continuing with her escape, she decides to stick around thinking she might be able to bare the creepily gothic boarding school if he’s there. Even though her parents live on campus, Bianca’s forced into the dormitories, rooming with a popular girl who only just tolerates her. The rest of the in-crowd makes little attempts at civility, always putting down those weaker than themselves. Bianca only hovers on the brink between the two social classes because of her parents, who are actually more cooler than her. The only person she really wants to be around is Lucas, but he’s keeping her at a distance and she can’t understand why. If that wasn’t enough to keep her life complicated, Balthazar, one of the most popular guys at school, also starts taking an interest in her. Cliches are riddled throughout Evernight. Plain girl gets saved by hot guy. Girl becomes obsessed with guy. Guy avoids girl. Bitchy girls rule the boarding school. Strict teachers. School dances. ANGST. Yes, all of this occurs a lot in young adult. At least there aren’t any dead parents in this one. Although it’s a vampire novel, there is virtually no reference at all in the first half. For all I knew, it could have been Gossip Girl I was reading. There are plenty of miscommunications between the two main characters that seem to keep going back and forth, leading to lots of hurt feelings. This felt dragged out, as nothing really seemed to be happening. Basically just character building. I know this is necessary, but I felt more could have been happening at the same time. What I didn’t get was Bianca referring to herself as a very shy person, yet never seeming to be an issue throughout the book. She actually stands up to teachers when she believes in something and interacts with others she hardly knows frequently. Not a big deal, but why mention she’s shy in the first place. Unless Lucas’s presence magically cured her of it. When angst wasn’t getting in the way, Bianca and Lucas actually made a good couple. I felt their attraction, and really enjoyed reading those parts of the book. Lucas had the whole protective boyfriend thing down pat, while also dripping with sweetness. Once the twist hit, the book felt completely different, in a good way. I was caught off guard, which is something I like in a book. The plot quickly picked up enough so that I’m glad I stuck with it. The final twist I predicted, but there was enough emotion behind the characters that I overlooked its obviousness and went along with it. I especially liked Balthazar, as he managed to be popular without falling into the douchey Neanderthal category. Vic was a fun guy too. I loved his overly enthusiastic outlook on life. He’s someone that anyone (with a pulse) would be happy to be friends with. 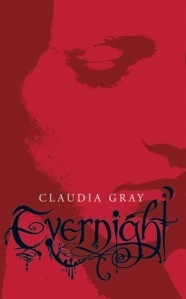 While not the most original book out there, it’s sure to find fans in the vampire genre. I’m already attached to the characters enough that I want to see how the rest of the series manages to go on from here. Those who enjoy Vampire Academy, they have a similar feel. Romance junkies should find something interesting in here. Hey Brett, great review, you’re right the action and the storyline pick up a lot more in the next books. This is a book where I liked the side characters more than the main ones, Balthazar and Vic were my favorite. I still haven’t read the last one but reading your review has made me one to go get it and figure out how it all wraps up. I kind of forgot about the series. Hey, just me popping in again, I totally agree with what you say about Bianca referring to herself as a ‘shy’ person even though her actions are totally contradictory. Now that you mention it I guess it could have kinda passed for a Gossip Girl novel in the first half. I’m with you there also, about there thankfully, not being any truly ‘dead’ (technically undead haha)parents. Too many YA books are starting with parents death. Great review!